Flaxseed oil and brown flax seeds. Brown flaxseed, also known as linseed, comes from the flax plant, which is cultivated for its seeds as well as its fiber. The seeds, which are a little larger than sesame seeds, are an excellent source of omega-3 fatty acids and are rich in dietary fiber and lignan. Used since ancient times, flax seeds are renowned for myriad health benefits. The flax seed is one of the best sources of lignans, which are estrogen-like chemicals found in plants and which act as antioxidants. Antioxidants remove free radicals and aid in the prevention of diseases such as cancer and coronary heart disease. Flax is the most widely available botanical source of omega-3 fatty acids, which help prevent these diseases and which improve immune function, improve brain functions such as memory and act as an anti-inflammatory. Other health benefits provided by regular consumption of brown flaxseed are protection against diabetes, the prevention and control of high blood pressure and the reduction of cholesterol levels. There are two types of flaxseed: brown and golden or yellow. Golden flaxseeds have a mildly nuttier taste than the brown flaxseed, but there is no difference between the two in terms of nutritional content. Flaxseed or linseed oil, extracted from the seeds, is a popular nutritional supplement as well as a component of wood finishing products such as paint and varnish. Brown flaxseed is best stored whole and milled or ground just before consumption. Whole seeds pass through the digestive system without being absorbed, so the nutritional benefits are lost. After they have been ground, flaxseeds become rancid within a week if stored at room temperature. Ground flax can be baked or cooked in foods without losing any goodness or can be consumed as is, as a topping. Flaxseed oil, however, should be added to food just before serving and after cooking. Flaxseed or linseed oil, extracted from the seeds, is a popular nutritional supplement as well as a component of wood finishing products such as paint and varnish. The oil contains the essential fatty acids but does not contain the fiber, protein and lignan content of the seeds, so is not as beneficial. Sensitive to light, heat and oxygen, the oil should be stored in opaque bottles in the refrigerator. Brown flaxseed contains a lot of fiber, and if too much is consumed too quickly, it can upset the digestive system. One to two spoonfuls of ground flax taken daily is adequate to meet dietary needs. If consumed in large amounts, there might be a laxative effect, and conversely, if not enough water is taken during the day, constipation could result. An allergic reaction to flax is rare, but breathing difficulties, itching and rashes have been reported. What is the Connection Between Linseed and Flaxseed? What are the Most Common Flax Side Effects? How do I Choose the Best Flaxseed Meal? 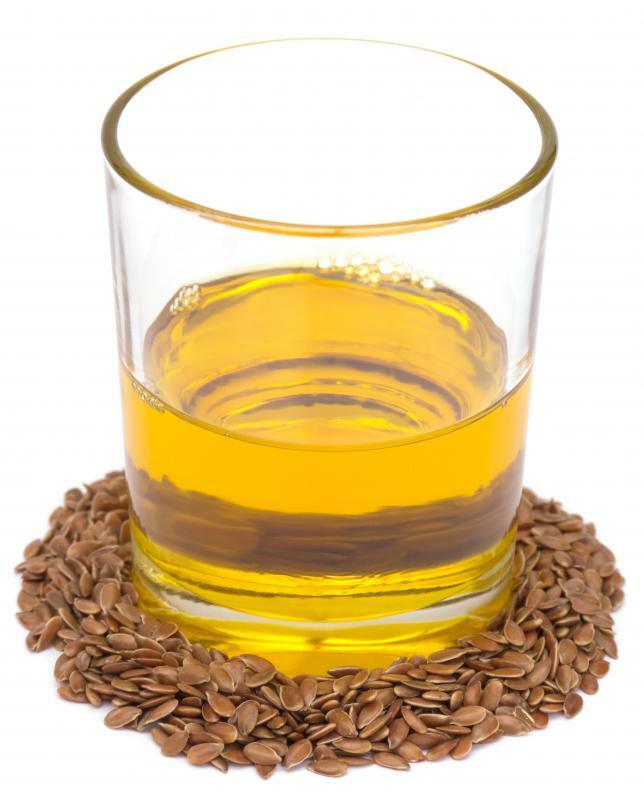 What are the Most Common Flaxseed Oil Benefits? How do I Choose the Best Ground Flaxseed? What are the Most Common Flaxseed Side Effects?